The great American novelist and journalist Ernest Hemingway marked the path to Pamplona to many people with his work ‘The Sun Also Rises’. The attraction of this story is still in force, and many people come to Pamplona moved by his unique writing style. Fiestas de San Fermin or also known as ‘Sanfermines’ is one of the biggest festival and among the seven most famous worldwide. The Bull Run is the event at the heart of the Sanfermines in which bulls chase the villagers through the streets and makes the Fiesta an unimaginable spectacle in any other part of the world. The celebrations start at noon on the 6th of July when the festival begins with the setting off the pyrotechnic chupinazo (inaugural rocket) having eight days ahead of entertainment and fun. Pamplona, a city, located on the fertile plain of the river Arga, its streets, and squares of its historic quarter still preserve a significant collection of monumental buildings dominated by its churches and medieval walls. A city in which tradition and modernity live in harmony. Founded by the Roman general Pompey in 75 BC, the city grew in importance in the 10th century with the kingdom of Pamplona. During the reign of Sancho III el Mayor (11th century), the current route of the Way of Saint James was established through the lands of Navarre, a fact that would influence both the city’s appearance and its historical development. A visit to Pamplona, capital of the Navarre region, should begin in the “hamlets,” a group of districts of medieval origin representing the seed from which today’s city grew. In the centrally located Plaza Consistorial square stands the majestic Baroque façade of the Town Hall. This building, from 1752, commemorates the union of the hamlets of San Cernín, San Nicolás, and Navarrería. 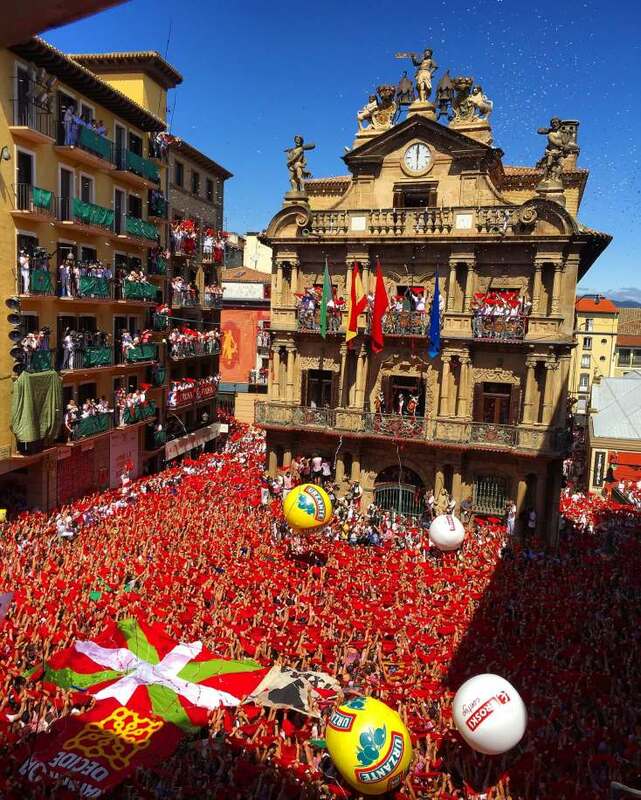 La Fiesta de San Fermín – Setting religion to one side, the Bull Run is the central event of the Festival and the one which has projected the image of Pamplona. According to tradition, San Fermín was born in Pompaelo (now Pamplona). He was the son of the pagan senator Firmo, a high civil servant of the Roman administration who governed Pamplona in century III. It was in this century that the city received the visit of Saint Saturninus, who arrived to evangelise it and obtained the conversion of Firmo and, therefore, of his entire family. Fermin was baptised with his parents by the saint himself in the place where today it is known as ‘Pocico de San Cernin.’ According to legend, San Fermin was the first bishop of Pamplona, although it was in France, specifically in Amiens, where he settled: there he organised the construction of a church and was also appointed the bishop for 24 years. In this French city, it is said that baptised 3,000 people, and it was there where he ended up dying beheaded during the persecution of the Emperor of the Diocletian. Years later, in 1186, the story goes that Bishop Peter of Paris brought from Amiens to Pamplona a relic of the saint’s head. This is why, rightly or wrongly, the famous red scarf in the neck during the festival is often related to the beheading of San Fermin in martyrdom. With the opening of the twentieth century, the fame of festivities and bull runs extended to bordering provinces, including the south-west of France. 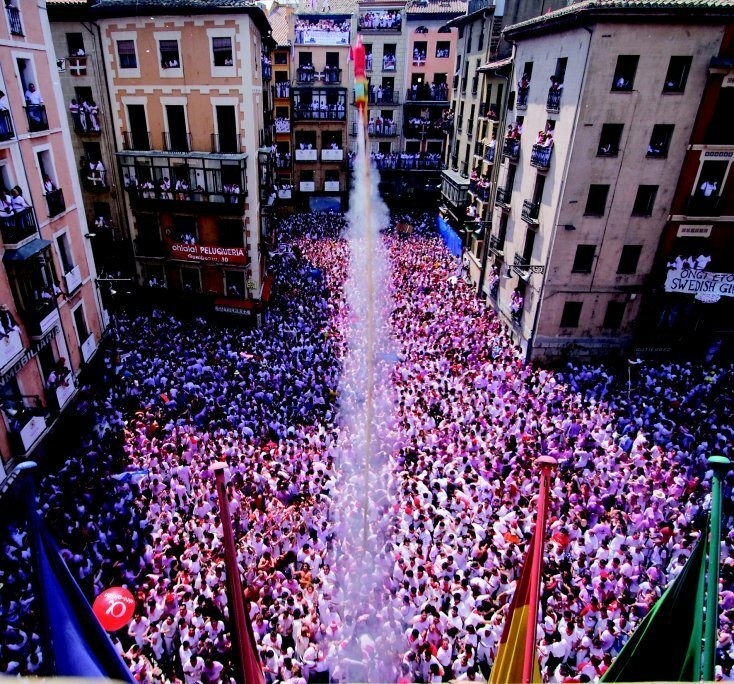 Most of the youth looked forward to the celebrations all year, saving money until they had at least fifty pesetas, the minimum necessary to watch the running of the bulls, have a snack and wine, eat lunch and dinner out, and eat churros with brandy a couple of times each San Fermín day. Nowadays, men and women, young and young at heart transmit the same emotions and every morning during the fiesta, they help to keep the tradition alive. Get a feel of the tension of the run in the sharp corner at the end of Calle Mercaderes or experience as the adrenaline rises to reach peak levels at the famous Calle Estafeta. And for the bravest or bold, but not recommended to the faint-hearted or those with heart conditions, you can follow the tradition and join the bull run. It takes place on the hill of Santo Domingo and on-route to the bullring…imagine running in front of 600-kilo bulls armed with massive horns, the adventure is guaranteed! 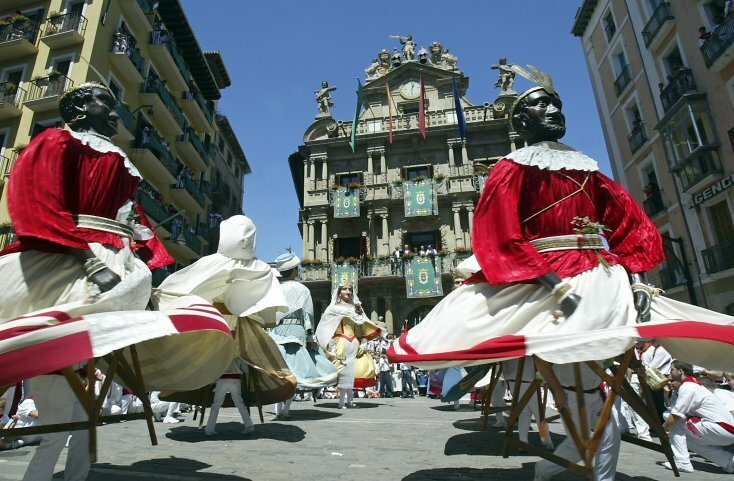 Whether you are in Pamplona to join the bull run at the Sanfermines, marvel at its beautiful architecture, wander along its narrow streets or to discover the sites that inspired Hemingway’s stories and that to date remain intact, this city is unique, and its many stories and deep-rooted traditions are bound to inspire enduring memories. Welcome to one of the biggest festivals of the world, and Hemingway’s first obsession!